Hello, I'm Gregor and I put this site together. 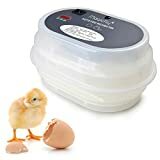 At first, you'll find an overview of recommended egg incubators, followed by a public poll and a general buying guide on egg incubator. 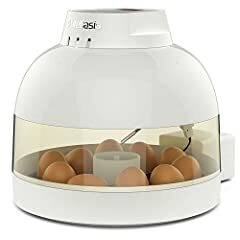 Further down on this page, we do link to other well-written articles and reviews about egg incubators. At last, you'll be able to weight in your own opinion in the comments section. If you also want to vote on the best egg incubator, click here to view the poll. 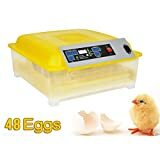 To say the least, egg incubation machines are a specialized tool. As such, most people never need one. You must have some interest in the subject, however, or else you would not be reading this. So, let's talk about the three main types of incubators, and how they fit with all the major factors that you must take into account before purchasing one. The differences between a setter and a hatcher come from the different stages of the process in which they are used. As both of their names imply, a "setter" is simply a place for the eggs to sit and develop. A "hatcher" is a similar machine that is designed to be used for the actual hatching process. While all three of these machines can be found on the market, most of those that you will find are combination incubators. Let's discuss how they work for the benefit of those who may know little or nothing about incubators. They are used to create the proper conditions for the hatching of eggs. Their main functions are the regulation of temperature and humidity, as these both play a big role in proper development of an embryo. Many of them also turn the eggs from time to time. 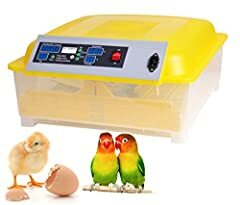 These machines basically do the work of a mother hen, though I hesitate to make that comparison because incubators are used to hatch many different species of bird eggs and even the eggs of reptiles. Another important factor is ventilation and air flow. All incubators must have at least a certain amount of air flow because fresh air is required for the proper development of embryos. Like all living creatures, embryos and chicks consume oxygen and exhale carbon dioxide. If there is insufficient airflow, the carbon dioxide will build up and the embryos or chicks will die. Sanitation is also very important. One of the most frequent problems in any incubator is that of bacteria/mold buildup. These problems are influenced by temperature, air flow, and humidity. Some types of improvised incubators, such as those made of styrofoam, are unsuitable because they will continue to be a breeding ground for these silent killers even when thoroughly cleaned with bleach. 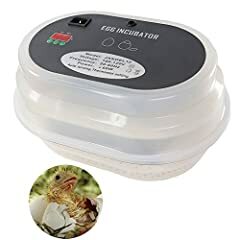 So, when considering what kind of incubator to buy, you must first consider size and egg capacity. Think about how many chickens you have, and how many eggs you expect to be incubating at one time. Make sure to think not only of the present, but also of the future. In other words, you may only have ten or twelve chickens right now, but how many do you expect to have in a year? two years? You must bear your long term needs in mind or else you will end up wasting money buying extra incubators. You also need to think about what kind of eggs you will be hatching. For the vast majority of users, these machines are used to hatch chicken eggs. Most incubating machines are designed accordingly. 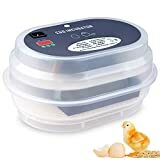 If you are raising ducks, geese, peacocks, reptiles, or anything other than a chicken, you will need to make sure that your incubator is suitable. This is where you need to have a thorough knowledge of the animals that you are raising. The best thing you can do is observe their normal maternal habits, because that is what the machine is duplicating. The best thing you can do is to put a camera on your hens right after they have laid eggs. Closely observe their habits. Watch how often they sit on the egg and when they get up. Note the time of day for every activity, so that you can construct a schedule that will be used to program your incubator in the correct way. Remember, there is no better teacher than nature itself. You should also consider whether or not the machine has a candling feature. This is simply a built-in light that allows you to get a partial look at the embryos inside the eggs. This process allows you to see the progression of the embryo's development while at the same time checking for any obvious defects. Some incubators have this feature built in and some do not. Some incubators have a fan and some do not. This is something that makes a fairly big difference. The constant movement of the air inside the incubating chamber creates a constant temperature that is the same throughout. Incubators without fans tend to have a certain heat gradient due to the relative lack of air flow. The control module is a very critical component to evaluate. 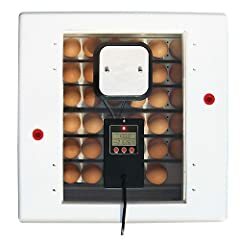 As you probably know, incubation success rates have a lot to do with creating certain specific conditions by manipulating temperature, humidity, etc. Being able to easily and accurately control that process is key. Many of the cheaper models do not offer very good control, while the high-end models will often have a sleek graphical interface that make them no more complicated to operate than the average smartphone. That brings us to one of the most important factors: egg turning. It is highly critical to turn your eggs at the appropriate time, just as a mother hen does. If you fail to do this, you can expect a very high death rate. Some incubators can be programmed to turn the eggs automatically at a preset time interval. Those who do not have this feature will require a greater amount of manual attention. 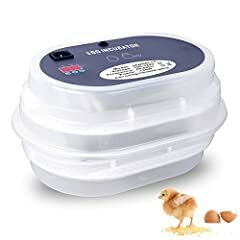 You will have to set an alarm so that you can remember to turn the eggs manually. This is a big problem if you have to leave home for hours at a time. If you cannot be at home to turn the eggs yourself, someone else will have to be there to do it. This is an important factor because a working person who raises birds as a hobby will probably have to leave the house for long periods of time in order to work. One little thing to look for is a sanitary liner. As stated before, buildup of mold or bacteria can be a big problem in your incubator. 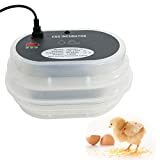 This is why it is recommended to thoroughly sanitize your hands before handling eggs that are destined for the incubator. For the same reasons, it is also very important to keep the incubation chamber itself clean and sterile. And when I say sterile, I mean truly sterile...no germs whatsoever. Some incubators come with a removable sanitary liner that can be cleaned and sterilized much more easily than the unit itself. While this is not essential, it can save you some time. When considering how important this feature is to you, think about your time constraints. If you have very little free time, this option becomes a bit more important. If the model does not have a liner, you should ask yourself how difficult it would be to clean. 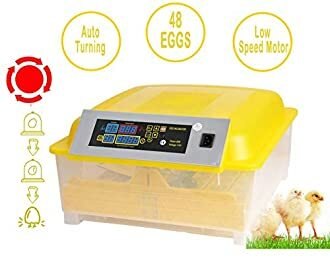 You also want to look at whether or not a given model of incubator is able to automatically control temperature, humidity, and other environmental factors. Once again, more automation means that you save time. For the most part, you want to keep the environment of your incubator constant. Small variations can, unfortunately, make a big difference in the survival rate of the embryos. Obviously, price is going to be a factor. But it's not as simple as just choosing the cheapest option that meets your needs. You should bear in mind that there is a direct correlation in this case between saving time and saving money. The more you spend, the more automated your incubator is likely to be. This saves time. The less money you spend, the less automated your incubator is likely to be. This wastes time. As with any other purchase, you must evaluate your needs and desires, then weigh them against your pocketbook. I would leave you with one final bit of advice: Remember that you are the only one that truly understands your situation and needs. Don't just take somebody's word for anything. New: Our editorial list of additional articles. 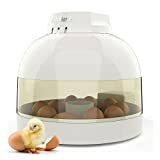 We decided to gather informartion all around the internet and present you a list of helpful, external links to interesting reads about the best egg incubators and their reviews and guides. How to Choose the Right Incubator and Eggs for Hatching? You're not convinced by the previous writings about egg incubators? Of course you can just choose by visual impression, that's why we present you all our chosen products at a single glance. A click on any image is enough to open an external link to the best offer we could find. Finally, we want to present you our rating criteria for our egg incubator comparison, so you can better understand and comprehend our recommendations and the rating process itself. 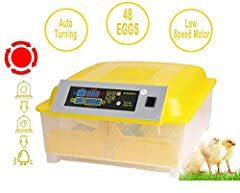 Furthermore, we still ask you to keep your eyes open for short term deals in order to make some great bargains with egg incubator in 2019. Published by G. Krambs on StrawPoll.com (last update on 2019-04-18 08:02:09). 18 of 22 readers found this article helpful.